Notes taken during Michael Faraday’s groundbreaking Royal Institution lectures on the nature of light and magnetism were sold last week by Bonhams for £5,400. The notes, bound in one volume, were compiled by Maria Herries, daughter of the politician and financier John Charles Herries, and cover many of Faraday’s lectures from the mid 1830s to 1850. Also included are letters to Maria Herries from Faraday’s close friend, The Reverend John Barlow, who took over the running of the Royal Institution from Faraday in 1843 and who, with him, introduced reforms to admit women members and ensure them equal access to lectures. Next to nothing is known about Maria Herries, although women such as the popular-science writer Jane Marcet, whom Faraday called his "first instructress" (DNB bio here, Wiki bio here) and the painter Harriet Moore (Wiki bio here) played important roles in the shaping of Faraday's thought and legacy. Faraday (1791-1867; DNB bio here, Wiki bio here) was one of the key figures of the Victorian era and, indeed, one of the most influential scientists in history. His discoveries laid the foundations of the field theory of electromagnetism and much of modern science. A modest man – he refused a knighthood and turned down the honor of burial in Westminster Abbey – Faraday was also a man of strong principle who declined to participate in the development of chemical weapons for use in the Crimean War. Passionate about education, he established the Royal Institution's Christmas Lectures for children and the Friday Evening Discourses for members – two series that continue to this day. 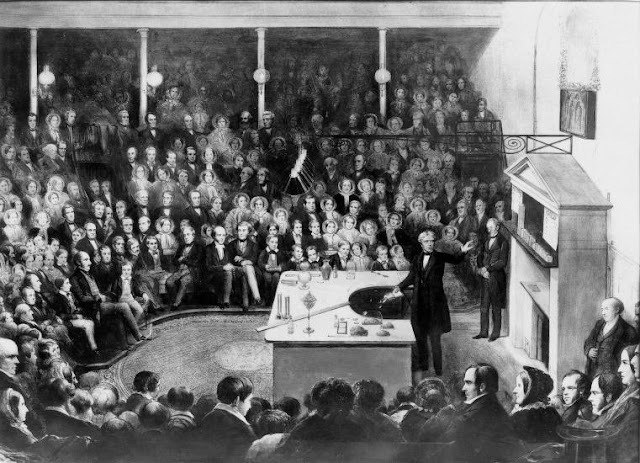 Shown above: Michael Faraday delivers a Christmas Lecture at the Royal Institution, c. 1855, with Prince Albert and his eldest son, Albert Edward (later King Edward VII), in attendance.